i've never been an OFW, but i know the feeling of homesickness quite well. it happens every time i spend a few months abroad. when the novelty and excitement of being in foreign country wears off, i start longing for the company of familiar faces and the comforts of home. but once i start missing the very things that i detest in the philippines-- the smoke-belching jeepneys which infest filipino streets, the thick throngs of people that madly flock to the malls for the midnight madness sales, and the brainless noontime shows that rot the mind and values of its viewers, i know that i've been downed by the homesickness bug! i mean, how could i even miss the pollution, the traffic, the scandals, and the hot weather of the philippines if not for homesickness! i remember that for some time, i lived in spain without any contact with filipinos. one day, as i strolled down an eskinita crowded with people, my attention was caught by a petite dark lady shouting to some kids, "hey, ip you dun't bihev, a mumu will git you!" i was so happy to recognize that this lady was a filipino yaya. 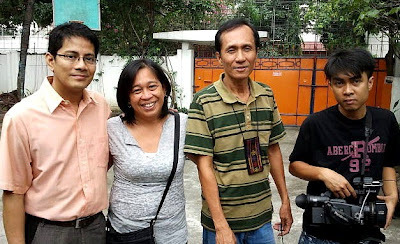 i approached her and she was equally elated to meet me-- another filipino on foreign soil. we spent a good long hour talking about everything we missed in the philippines. i also remember being in switzerland and not eating any filipino dish for months. one day, a swiss host surprised me by cooking some rice for lunch. boy, i never realized how plain rice could be so flavorful! as i savored each grain of rice in my mouth, i imagined myself eating it with kare-kare and sinigang and patis and bagoong! the good thing about homesickness is that it reminds us of everyone and everything good in the philippines which we easily ignore and quickly take for granted. despite all its flaws and imperfections, the philippines is still home and there will never be any place as sweet as our homeland! 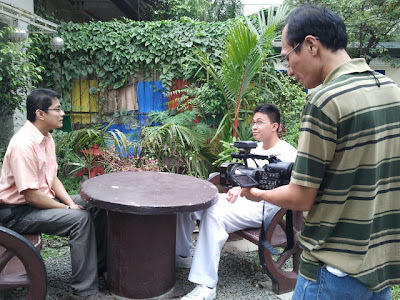 here i am being interviewed by balikbayan box! 's ma'am vk fernandez about the homesickness of OFWs. balikbayan box! 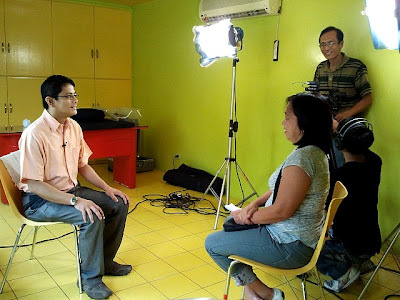 is abs-cbn's first and only tfc program to tackle the reality issues of OFWs and their families.